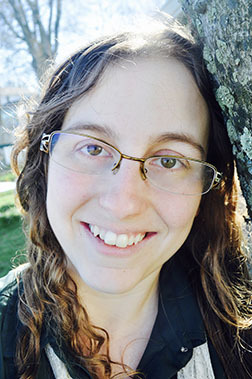 Today we welcome Sara Codair into our Flash Fiction Winners Circle! Sara won second place in WOW’s Winter 2016 Flash Fiction Contest with her entry, The Cell, which reminds us how lives can be disastrously shadowed by the nightmares one lives through. Sara has been writing fiction since she was in the first grade. One of her earliest works was in a journal she was required to keep for school. It was supposed to be about real things, so her teacher was not very happy to read about a boy who put on a cape, jumped off of a garage, and flew. Now, Sara writes made up things everyday. She also teaches both college level and developmental writing at Northern Essex Community College. When she isn’t teaching or writing, she can be found outside, where she will be hiking, swimming, gardening or curled up with a good book. Her favorite genres are urban fantasy and magical realism. She is in the process of revising a Young Adult Fantasy novel, tentatively titled Out of Focus. Her short stories have appeared in or are forthcoming from Foliate Oak, Centum Press’ 100 Voices Anthology, Sick Lit Magazine, Fantasy Crossing and Mash Stories. You can find her online at SaraCodair.com. WOW: Hi Sara, congratulations and welcome to The Muffin! From the posts I read on your blog it looks like you’re busily sending out submissions; how do you stay motivated? Sara: A friend of mine recently asked me this question. I told her that sometimes I wonder if it is motivation or addiction. I have all these stories in my head and don’t really feel like me if I’m not writing them down. Writing is time consuming, so there have been long stretches in my life where I didn’t write creatively--mainly when I was in graduate school--because I felt like I was just doing it for entertainment. As a grad student, I didn’t have time for things like entertainment and a social life. As I got a better grip on teaching and my career, I decided I had to make time to write. At first, it was just finishing the novel’s I had started years earlier. Then a friend, colleague and former WOW winner, Clare Thompson Ostrander, introduced me to flash fiction and a website called Mash Stories. After writing a few really bad flashes, I realized I could finish a draft in one sitting and revise it ten times over the course of a few weeks, then try to publish it. I got shortlisted by Mash on my third attempt. It was awesome seeing my story online where it eventually got over 1,000 views. I was hooked, constantly writing short pieces and sending them out while I took breaks between cycles of revising my novel. I’ve gotten over 100 rejections since December, but I’ve also gotten close to 10 acceptances. WOW is the first one that has paid up front. My other “paid” stories are to anthologies. One from Centum Press, will pay royalties . My goal now is to sell more stories to paying markets, and by end of the summer, start querying my YA novel to literary agents. I may have taken a long time to get to this point, but what keeps me going in spite of the rejections is a need to validate my writing, get people to read it, and potentially make money off of it. As an only child, I grew up getting what I wanted 99% of the time. I want to get my stories published. I need to get my stories published. Nothing is going to stop me. WOW: That’s a great attitude…and a big “thank you” to Clare for sharing our contest with you! (Clare won third place in our Spring 2013 contest with Mercy). On our Friday Speak Out, you talked about having a sprinter mentality, with one attribute being short-termed focus. What tips do you have for those of us who have trouble staying focused through the revision process? People who can’t focus (like me) still want to write and revise longer pieces. What works for me is setting small short-term goals that allow me to attack the story one piece at a time. I work on a piece for a half hour in the morning, go for a run, then work on it for another half hour before I go to work. If it is summer and I have a day “off” that I plan to dedicate to writing/revising, then I break up short spurts of writing with gardening, running, and cleaning. If we are talking long term, well, take it one step at a time so I overwhelmed by the big picture. I set tiny goals and accomplish one then move onto the next, that way, I’m not really staying focused for the long haul but on one little piece at a time. One goal might be read one chapter looking to see if my dialogue feels genuine. Am I committing an info dump through forced awkward unnatural conversations? If so, I fix it, and call it a day. The next day, see if that chapter is better, and if it is, do some language revision/editing--word choice, punctuation sentence structure etc. Additionally, I find it easier to stay focused if I am just revising my novel and one flash. Any more than that I jump around too much and never get anything done. If I get a rejection, I will reread a piece, making sure there aren’t errors or any glaringly obvious content mistakes. If I decide to make drastic revisions, then I dedicate a few “days” to just work on that piece. WOW: Fitting an entire story into a flash piece can be challenging; some writers resort to “the dialog information dump” for communicating backstory. Can you share some thoughts on how to work around the info dump? Sara: A year ago, I was committing info dumps left and right in dialogue. Then someone told to read Noah Lukeman’s The First Five Pages. I didn’t read the whole book because there was a lot of outdated information about manuscript format, but I did read the section on dialogue. There was one particular exercise that changed how I write. Essentially, it asked me to write my dialogue assuming the readers know everything they needed to already. The dialogue felt so much more real than it had when I was using it as means to give background. The readers don’t need to know everything. Think of what they really need to know [and] when. What can they figure out from the way the character moves and reacts? What do they absolutely need to be told? What can they get by without? Make them work for their backstory. The Cell was originally twice as long as the version seen on WOW and it was filled with gruesome details about the bad things that happened to Lu. The reader doesn’t need to know what those specific things are. All the reader really needs to know was that she was a POW who was interrogated. Was she electrocuted? Water boarded? Raped? Starved? The reader can decide for herself. The same thing happened with the YA Fantasy Novel I am working on. There was one chapter where my dialogue went from being very “Real” and “Genuine” to a huge info dump about the world. I did the exercise from the first five pages, and made it much better. Just let the story happen. Don’t try to use your dialogue. Work bits and pieces of background into the way you describe things and what your narrator things about. WOW: Great tips, want to share some more? What tips do you have for dealing with rejection? Sara: Remember that writing is subjective. Everyone has a different opinion about what is good. If one editor rejects you, it doesn’t mean your piece is bad. Start with publications that send personal rejections, or offer critiques, even if you have to pay a few dollars for them. You don’t have to do everything the editors say because often, you can’t revise and resubmit if the piece gets rejected, but it will give you a lot of insight into what that particular publication and possibly what similar ones look for. Keep them organized. I use both a spread sheet and the submission grinder to track what I have sent where so I don’t accidentally send one piece of the same publication twice. The dark side to this is that the numbers can be scary, but that just makes the successes sweeter. WOW: What is the one most important lesson you tell your students that would help our readers? Sara: Don’t censor yourself on the first draft, but make sure you revise and revise and revise and revise before you call it done. WOW: That really is the best advice. Thank you, Sara. Great interview, ladies! Sara, I love your persistence, and thanks for sharing some great writing tips. I agree with you and Mr. Lukeman about dialogue. We actually interviewed Noah on WOW several years ago...he was our first and only male interview! (http://www.wow-womenonwriting.com/35-FE1-NoahLukeman.html) That's interesting about "The Cell" and I think the way you edited it makes it a much stronger piece. It works better when you let the reader actively fill in the blanks. :) I've been working on not censoring myself lately because you can't create something funny or great unless you let yourself play and stop worrying about what other people think. Thanks, Sara!